At MidAmerica Basement Systems, we're proud to offer a complete line of the most effective basement waterproofing products for your home. If you have any basement waterproofing needs in your home, call the experts at MidAmerica Basement Systems today. We offer free estimates in Peoria, Cedar Rapids, Davenport, Waterloo and throughout the nearby areas. Are you satisfied with how your basement looks, feels and smells? Do you have a leaky, wet, damp basement that you'd like to transform? MidAmerica Basement Systems offers products that can quickly and cost-effectively add beauty, value, and energy efficiency to your basement. At MidAmerica Basement Systems, we're proud to offer the complete line of Basement Systems products, with a solution for every problem homeowners have with wet, leaking, damp basements. 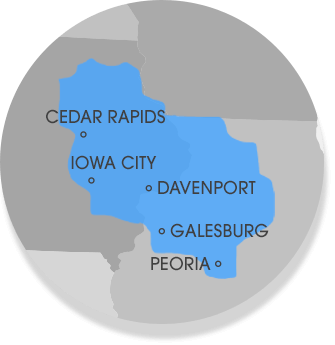 We offer free quotes in Cedar Rapids, Peoria, Waterloo, Davenport, Iowa City, Normal, Rock Island, Dubuque, Moline, East Peoria, Clinton and nearby. Contact us today to schedule your quote!